The Green Star Elite vs Green Star vs Kempo Green Power Juicer - all you wanted to know about twin gear juicers. One of the most frequently asked questions at the Living and Raw Foods Marketplace is "Which is the best twin gear juicer? The Green Power KPE-1304, Green Star or the Green Power ?" We will attempt to educate you further on these machines, and give you our opinion. A juicer that is suited to meet your needs is truly the best juicer. Clearance between the two gears ??? 4/1000 4/1000 ??? Cutting Portion 2.75 inches 3.25 inches 3.25 inches ??? Diameter of Gears 1.73 inches 2.34 inches 2.34 inches ??? Squeezing Chamber Volume 13.39 cubic inches 37.4 cubic inches 37.4 cubic inches ??? Straining Screen Surface Area 6.3 square inches 15.75 square inches 15.75 square inches ??? Size of Feed Chute 1.5" x 1.5"
1.5" x 1.5" 1.5" x 1.5" 1.5" x 1.5"
Staining White Plastic May stain from juices. Off White Plastic not as prone to staining. White plastic may stain from juices. White plastic may stain from juices. Juice Quality Better - Biomagnetic technology extracts most nutrients from juice and has even lower oxidation. Better - Biomagnetic technology extracts most nutrients from juice and has even lower oxidation. Better - Biomagnetic technology extracts most nutrients from juice and has even lower oxidation. Better - Biomagnetic technology extracts most nutrients from juice and has even lower oxidation. Construction Thin Plastic Housing with metal gears, metal juice screens in plastic frame. Thick Plastic Housing with metal gears, metal juice screens in plastic frame. Thick Plastic Housing with metal gears, metal juice screens in plastic frame. Thick Plastic Housing with metal gears, metal juice screens in plastic frame. Comments This is a the twin gear juicer that is smaller and more compact in size. It performs better juicing wheatgrass than the other twin gear units. This is the "updated" version of the green power juicer with a stronger and more compact housing, We prefer the Green Star Juicer, due to the longer warranty, and compact housing. This is the newly upgraded green star juicer. The triple stage juicing gears provides a higher yield than previous models. **Patented Twin Gear - Precision designed / engineered pair of gears that incorporate magnetic and bioceramic technology, pocket recess and specialized cutting mechanism. We hope you have learned more about the above twin screw juice extractors. The above juicers are the TOP of the line juicers and out perform the centrifugal and mastication style juicers. So when you purchase any of the twin gear juicers, feel confident you are purchasing a juicer that produces the best quality juice without spending $2000 on a Norwalk press. Want to juice a wide variety of vegetables and fruits Green Star Elite, Green Star, Green Power or Green Power KPE-1304 the design offers greater flexibility when juicing fruits. Want the most nutrients in the juice Green Star Elite, Green Star, Green Power or Green Power KPE-1304 utilize Bioceramic and magnetic technologies which help pull out more nutrients from produce. Wants the highest yield The Green Star Elite with its triple stage extraction achieves the highest yield of all twin gear juicers. Wants to juice alot of fruit We do not recommend the twin gear juicers for juicing mostly fruit. Overall quality We have seen good quality with the Green Star Elite. Color Green Star Elite, Green Power and Green Power KPE-1304 are white in color, while the Green Star is a light ivory color. Best for Traveling The Green Power KPE-1304 is much smaller than either of the other two juicers. "Gotta have the best all-around" juicer with versatility to juice wheatgrass, fruits, leafy greens, and hard vegetables We currently prefer the Green Star Elite, with its triple stage juice extraction, it achieves a higher yield than all other twin gear juicers. It is a versatile machine that juices a wider variety of fruits, vegetables, and is a multi-purpose machine. Please note, although these juicers oxidize the juice the least, for best results: We believe that juice should be consumed right after they are produced for the maximum nutritional and enzymatic value. We have used several twin gear juicers. We like the Green Star and Green Power because they are versatile, and can do more than just juice. While the twin gear juicers work REALLY well when juicing HARD, FIBEROUS vegetables, they are not the best at juicing fruits. If you want to juice MOSTLY fruits, we do not recommend a twin gear juicer. How does the various specifications listed above affect juicer function? Gear Length - Longer gears provide more surface area for increased juicing efficiency. Gear Weight - Heavier Gears result in a stronger, more heavy-duty product. Gear Diameter - Larger Diameter gears can handle larger produce more easily. Gear Circumference - Greater circumference gives more triturating capacity per cycle. Rotational Speed (RPM) - A lower rotational speed contributes to less oxidation and heating of the juice. Straining Screen Surface Area - Larger size allows more pulp to be squeezed for a longer time. Juicing Chamber size - Larger squeezing chamber allows for longer squeezing period which may increase the total amount of juice obtained from produce. Motor Wattage - Higher wattage motor results in less strain on motor, and less heating of the motor, as well as increased durability. Does the nutritional content of the juice produced vary between the Green Power Kempo and the Green Star/Power juicer? The HD(Heavy Duty) Twin Gear system has been laboratory tested to show that the juice made using the the HD System (Green Star and Green Power) are longer-lived and nutritionally superior. The smaller twin gear system does not have any substantiating evidence to back up their claims, except for the resemblance to the HD Twin gear system, and the reputation that the HD Twin Gear system has won. What is the difference between the Green Power and the Green Star? Green Power Juicers have 2 models that are actively marketed in U.S., which are GP E-1503 "GOLD" and GS-3000 "Green Star". GP E-1503 "GOLD" has been in the market for about 10 years and has proven its capability and function. It is a deluxe model including all options such as PASTA and MOCHI Maker. GS-3000 "Green Star", which has just been introduced into U.S. market, also has proven its capability and function. GP-E1503 "GOLD" and GS-3000 "Green Star" share the same patented, twin gear juicing technology by giving maximum juice quantity with optimum nutritional value. Independent nutritional testing on juicers and freshly squeezed juice, has already shown the patented twin gear technology to be superior in extracting maximum quantity and highest quality juices from many types of produce. Most of features including, Twin Gears, Fine Screen, Coarse Screen, Homogenizing Blank, Wooden Plunger, Plastic Plunger, etc. are all the same. Glass bowls have a little different shape but has the same quality of glass. However, housing and casing of them are different from each other in that those of the new GS-3000 "Green Star" has slightly compact. GP-E1503 "Gold" has has 2 years warranty but the new GS-3000 has been introduced with 5 years warranty. We prefer the Green Star model over the Green Power model due to the longer warranty, compact design (a few inches smaller) and new stronger housing. Is there a difference in the size and power of the motor in the different twin gear juicers? The Original Full Size HD Twin Gear Machines (Including the Green Power and Green Star juicer) have a 190 watt fan cooled motor with gear box using large shafts and gears. The Small Twin Gear Machines (Green Power KPE-1304) have a 150 watt motor with gear box using smaller shafts and gears have a tendency to overheat (not fan cooled). Do you offer the other small twin gear juicers? If not, why? We choose to offer quality units at affordable prices. Its also important to us that the manufacturer (or importer) that is selling the juicer will be around to service the juicer after it has been sold. We firmly believe that Tribest, who manufacturers the HD twin gear juicers (Green Star and Green Power) is a reputable and solid manufactuer (They manufacturer and distribute their HD juicers). 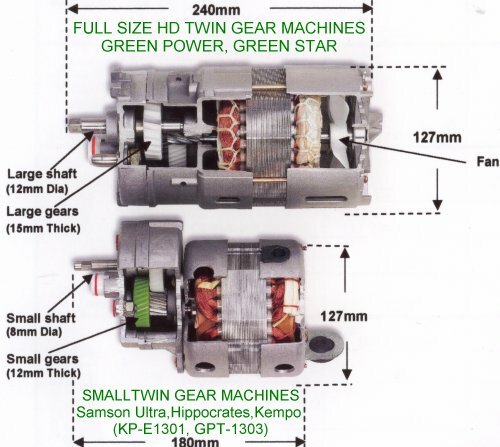 The Small Twin Gear Machines They are made in Korea by a company called GPT and imported into the United States under a variety of names, such as: Samon Ultra, Green Power Kempo and Hippocrates Juicer, and Green Power KPE-1304. They are all basically the same juicer with a few minor variations. We decided to offer the Green Power KPE-1304 juicer since it is the latest version of the juicer, and the importer has a proven track record in the juicing business. Here is an unfortunate of what happen to someone that purchased a hippocrates juicer... For a limited time, we made a special closeout purchase on the Mini Green GPT E1201 and are able to offer these machines at 35% off the original retail price. Click here for further information. What about an actual world test of the two juicers head to head? We did a head to head comparison of juicing celery with the Green Star and Green Power KPE-1304. We juiced 2 pounds 5.4 ounces in each machine. Initial Impression: The Green Star is a tiny bit larger and heavier with larger gears and juicing screen. Celery Stalks were fed through the juicer. After all the celery was fed through the juicer, the pulp was then fed through the juicer for one extra time to maximize the yield. We obtained a few extra drops of juice from doing this. While Using the Machines: While feeding the celery in Green Star the only trouble was making sure to push the end of each previous stalk into the gears. On the Green Power Kempo, the gears seemed to move faster but the juice would back up the shoot a little bit so I had to mash down some of this pulp and it would take a few seconds for the backup to recede. On Cleaning: They were just about as easy to clean. On the Green Power Kempo, the parts were harder to clean, since they were smaller and the tight passageways made them harder to clean. Final Results: In my opinion they both performed well, and did about the same job juicing. The juice was delicious out of both of the juicers. Don't forget about the pulp! They both produced a nice delicious edible salty pulp which I think is the best part and do not recommend tossing out. After Thoughts: This was our test, juicing a SINGLE type of produce. In most instances, a person will be juicing a combination drink, where many types of vegetables and fruits are juiced. In real world results the juicers are similar when juicing celery, but may differ when juicing combinations. Be sure to read our new article that compares all low rpm juicers, including the green life juicer, omega single auger, Samson and champion.